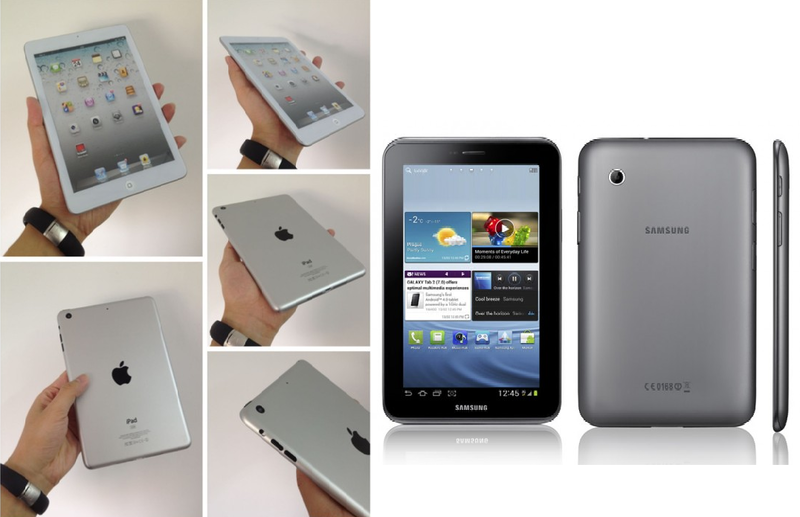 Let’s compare the Apple iPad mini and Samsung Galaxy Tab 2 and list down its detailed briefing which will help you to decide between two that which one you like to prefer and buy for you. Apple Inc. finally announced their much hyped and awaited smaller version of iPad and named it iPad mini with 7.9in display. This device is now available in the market including UK from 2 November 2012. Currently, considering the size of the display has already created threats for the existing 7in tablets in the market. iPad mini: iPad mini runs on the latest version of operating system by Apple i.e. iOS 6 which was announced in September’12. This new iOS is already flooded with many new features. With major issues with maps, rumors are made that Apple is expected to release iOS 6.0.1 soon. 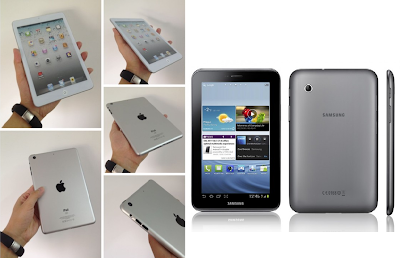 Samsung Galaxy tab 2 7.0: It was first shipped with Android 4.0 (Ice Cream Sandwich) software version. Samsung has already released their version i.e. jelly beans but unfortunately for Galaxy tab 2 7.0 manufacturer failed to provide details on the particular release date for the Jelly Bean. iPad mini: It got Apple's A5 chip featuring a dual-core processor, this is the similar processor that powers iPad 2. Still they have not revealed any detail about the RAM however it is expected to be 1GB. Samsung Galaxy tab 2 7.0: It got Texas Instrument's OMAP 4430 chip featuring a dual-core processor with PowerVR SGX540 graphics unit. The processor runs with a clock speed of 1GHz. The tablet has 1GB of RAM. iPad mini: It got 7.9in LED-backlit Multi-Touch display with IPS technology. The resolution of the screen measures 768 x 1024pixels which is slightly less than Samsung by 163ppi. Apple claims that user will get the same experience on mini as they used to get on iPad and iPad2 but with only difference that screen is smaller by 35%. Samsung Galaxy tab 2 7.0: It got PLS LCD display which uses TouchWiz UX user interface (UI). The resolution of the display is 600 x 1024pixels with pixel density measuring 170 pixels per inch (ppi). iPad mini: It measures 200 x 134.7 x 7.2mm in thickness and is lighter when compared to the Galaxy tablet. With Wi-Fi + 3G/4G version of iPad mini is just four gram heavier than the Wi-Fi version at 312g. It is 23 per cent thinner and 53 per cent lighter than the third generation iPad. Samsung Galaxy tab 2 7.0: It measures 193.7 x 122.4 x 10.5mm in thickness and weighs approximately 345g. iPad mini: Available in 16GB, 32GB and 64GB. Samsung Galaxy tab 2 7.0: Available in 8GB, 16GB, and 32GB. However, no price or release dates for the 32GB version in the UK. They also provide microSD card for additional storage space-a storage feature Apple's iPad mini lacks in. iPad mini doesn’t support cellular network phone calls though you can make calls using VOIP, Skype or other chat options using 3G or Wi-Fi. Samsung Galaxy tab 2 7.0 gives you the option where you can make phone calls i.e. there is no need to carry your phone if you have galaxy tab. At the end, we can say - its completely depends on a person's choice and preference. If you are an Apple's loyal customer you would like to experience this new product for sure. However, whether its an Apple or Samsung, choose your device smartly. Always make a to-do list and refer to your budget and the features you are looking at your device before buying it, which not just saves time but helps you to not to make any mistakes before buying anything. By Omnie: A mobile application development and web application development company.